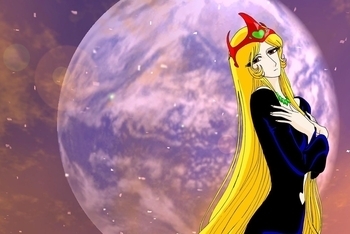 Queen Millennia (Japanese: Shin taketori monogatari: Sen-nen Jôo - The new tale of the bamboo cutters: The queen of a thousand years) is a science fiction anime by Leiji Matsumoto set in the Leijiverse. It is (very roughly) based on a Japanese folktale called Taketori monogatari which tells of a girl come down from the stars to rule Earth for 1000 years. The young Hajime Amamori makes friends with a new girl at school (and assistant to his uncle, an astronomer), Yayoi Yukino. It later turns out that she is in fact an alien sent to Earth to supervise the undercover preparations for the day that the solar system's tenth planet, Lar Metal, will collide with Earth and wipe out all life on September 9, 1999, at 9:09:09. After a while, she starts plotting against her destined fate and tries to find a way to save humanity from destruction against the will of her mother, the queen of Lar Metal. The series was popular in Europe and Latin America in the end of the '80s/beginning of the '90s, but has never been published on video/DVD. In the US, the series was cut together with Captain Harlock by Carl Macek/Harmony Gold and published under the name Captain Harlock and the Queen of a Thousand Years. There is also a full-length movie which changes the original story somewhat. The Chosen One: Subverted in that she should actually bring about The End of the World as We Know It: Yayoi. And subverted again in the end. Crystal Spires and Togas: Lar Metal fits this to a t.
The Faceless: Both the Millennium Thief and the Queen, though we get to see them both in the end. God Save Us from the Queen! : Very much indeed. HeelFace Turn: Very subverted as it's the title character who does it very early in the series. AND she thought she was the good one all along. FaceHeel Turn and You Can't Fight Fate in Galaxy Express 999, where Yayoi survived her sacrifice and succeeds her mother as Queen Promethium, putting her identical daughters in a similar situation as Yayoi was in. Heroic Sacrifice: Yayoi. She gets better in the distant sequel but is Killed Off for Real in the 1982 movie version. La Résistance: The Millennial thieves. Leave the Camera Running: Quite common in the movie, where the opening scene is a pan over a star field that runs very long with almost nothing happening. Luke, I Am Your Father: Yayoi and her sister Selene/the Millennium Thief. They were even having a Sword Fight at the time. How much more obvious can you be? Royal Blood: is the source of super powers. Solemn Ending Theme: This . True, the title theme isn't exactly Hard Rock either, but the ending seems to be a bit more solemn. Theme Naming: Matsumoto loves this trope. There Is Another: (Debatably) Selene And also Yayoi's OTHER sister. Villain Ball: Having your daughter grow up on another planet- okay. Doing this very early so she can never have a true attachment to her "true" home- stupid. Assuming she would work against the planet she had grown up on for the sake of a planet she has little more attachment to then Saturn- now that's an Atlas-sized villain ball.